Justice Department Fires U.S. Attorney Preet Bharara : The Two-Way As the federal prosecutor for the Southern District of New York, Bharara pursued a number of high-profile cases. Bharara and 45 other federal prosecutors were asked to resign Friday, but he refused. Preet Bharara, the now former U.S. Attorney for the Southern District of New York, speaks at the Wall Street Journal CEO council annual meeting in Washington on November 15, 2016. This story was updated at 5:45 p.m. I did not resign. Moments ago I was fired. Being the US Attorney in SDNY will forever be the greatest honor of my professional life. U.S. Attorney Preet Bharara, one of 46 federal prosecutors asked to resign Friday, refused to step down, and was fired. "I did not resign," Bharara tweeted. "I was fired. Being the US Attorney in SDNY will forever be the greatest honor of my professional life." As the federal prosecutor for the Southern District of New York, Bharara pursued a number of high-profile cases, including criminal cases against defendants like Times Square bomber Faisal Shahzad, and won a $1.8 billion settlement against SAC Capital Advisors for insider trading, shutting down the hedge fund. The Justice Department asked Bharara and 45 other federal prosecutors to resign. Such requests are standard from a new administration, as it seeks to clear out political appointees from the previous president. NPR's Carrie Johnson reports the Justice Department has confirmed that Bharara was fired. The department said Bharara is no longer U.S. Attorney in the Southern District of New York, and that he is being treated like the other U.S. Attorneys. Career attorneys will continue the work of the office. Bharara had previously told reporters that Trump had asked him to stay on. On Wednesday, NPR's Jim Zarroli reported that a group of ethics watchdogs sent a letter to Bharara, requesting that he look into Trump's businesses and whether they violate the Emoluments Clause of the U.S. Constitution. Bharara's office declined to comment. Senate Minority Leader Chuck Schumer released a statement praising Bharara. 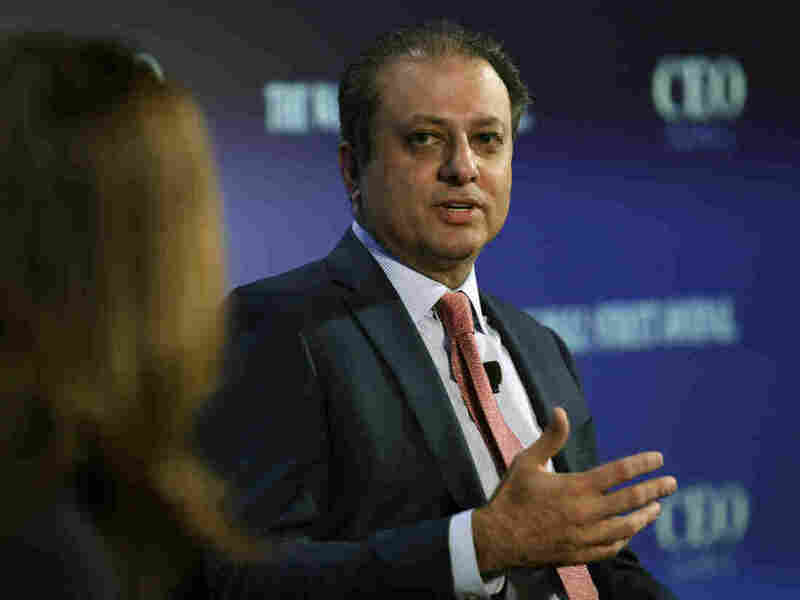 "Preet Bharara has been an exemplary U.S. attorney for the Southern District of New York. His relentless drive to root out public corruption, lock up terrorists, take on Wall Street, and stand up for what is right should serve as a model for all U.S. attorneys across the country. He will be sorely missed," Schumer's statement said.